SAN FRANCISCO — The California Public Utilities Commission on Thursday cleared the way for construction of the Sunrise Powerlink, a contentious transmission line that promises to bring more reliable and renewable power from the Imperial Valley to San Diego. 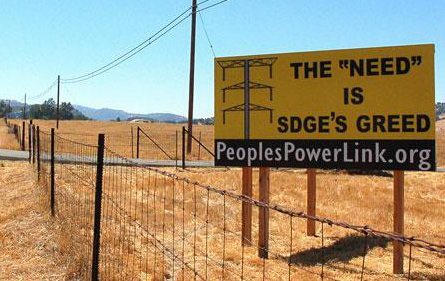 The 4-1 vote allows San Diego Gas & Electric Co. to move forward with the 123-mile, $1.9 billion power-line project, which could deliver enough electricity to serve 650,000 households. Meanwhile, the full effect on ratepayers has not been determined. Reed said the transmission line will have a net benefit to the utility’s 1.4 million customers by providing more reliability and flexibility once the on-switch is thrown in 2012. Customers may have to advance some of the construction costs, but will see a bigger return over time in energy savings, she said. “It will have a net positive benefit to customers financially,” Reed predicted. According to estimates by SDG&E and the commission, the line will save ratepayers $100 million to $200 million annually. Opponents, including Shames, dismissed those figures as exaggerated. The decision was a significant win for San Diego Mayor Jerry Sanders, the region’s business leaders and Imperial Valley planners who see their desert as the renewable energy hub for California. At the same time, it was a disappointment to for many environmentalists, who worry about the effects of 150-foot-tall towers on unspoiled deserts and mountains. “Corporate profit won out today,” said the Sierra Club’s Micah Mitrosky. Nevertheless, environmentalists took solace in the fact that they blocked SDG&E from running the transmission line through Anza-Borrego Desert State Park, as originally proposed. The route approved Thursday runs along Interstate 8, skirting edges of the Cleveland National Forest. The battle over the transmission line has been drawn out over three years, generating numerous marathon public hearings by the PUC and 11,000 pages of environmental studies. By the time the commission met Thursday, there was little doubt SDG&E would secure permission. Left undecided was just how tough an approach the commission would take toward requiring renewables. In the end, SDG&E won out when the majority voted for a plan advanced by Commission President Michael Peevey that was absent absolute regulations mandating the types of power that could be carried over the line. SDG&E had said it would commit voluntarily to renewables from various sources, including the budding thermal, wind and solar industries in the Imperial Valley. The utility is facing a state mandate to generate 20 percent of its power from renewable sources by 2010, but currently has not yet surpassed 7 percent.“It does not impose any enforcement obligations,” Grueneich said of Peevey’s proposed decision. Grueneich and her allies were clearly outgunned. Peevey’s proposal had the support of dozens of San Diego area business leaders who appeared before the commission Thursday. Commissioners also heard pleas from Imperial Valley officials, who said Peevey’s proposal would help ignite new businesses in a region where one-in-four are unemployed. “With the green rush, there’s a lot of interest,” said Andy Horne, deputy chief executive officer of Imperial County. One geothermal plant could employ 40 people, he said. San Diego leaders told the commission that the line is needed to ensure that the lights stay on. The region, Sanders told commissioners, relies on just a single power line and aging fossil-fueled plants for its energy. The antiquated system, he said, play a role in business decisions whether to locate in the region. “Energy reliability is a key consideration,” Sanders said. Newer Article: Will scandal over a shady land deal between a college district and developers be buried under the rug after the DA exonerates everyone?